My writing of this blog post stalled first due to a lack of research resources and then due to our move, which has more or less taken over my year. When it comes to research resources, there are plenty of papers and books that describe the circumstances under which the cemetery was founded, but I have found no resources, not even university theses or dissertations, which delve into the subsequent stages of the cemetery’s development and expansion. I have a pretty good idea of how I could find more information, but as it would involve making a series of appointments at research archives and libraries, I have decided to let it lie until the day I need to find a dissertation topic. Stockholm’s Northern Cemetery actually lies in the adjacent city of Solna, but it was founded by and is still maintained by the City of Stockholm. The land originally belonged to the Crown and was a part of the Karlberg Palace estate; the land was well outside of the city and its tolls. 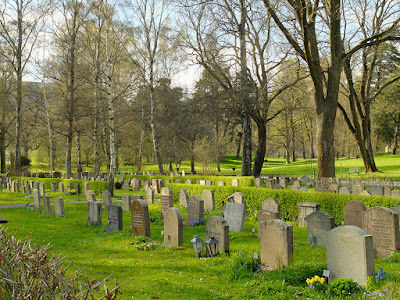 Although the new cemetery wasn’t super convenient to get to, its remote location was the point—not only were Stockholm’s traditional church graveyards overflowing and no longer able to support the city’s population, but nineteen century Stockholm was one of Europe’s dirtiest and deadliest cities. Wave after wave of sickness rippled through the city, and the death rate was one of the highest in Europe. Removing burials to the countryside was one of Stockholm’s first active strategies for improving public health. The idea of an edge-of-town cemetery was first mentioned in 1802, but it wasn’t until 1815 that land was donated by the king and designated for the purpose. In 1817, City Engineer Hieronymus von der Berg and City Architect Carl Christoffer Gjörwell drew up an ovular and a semi-circular design for the cemetery. 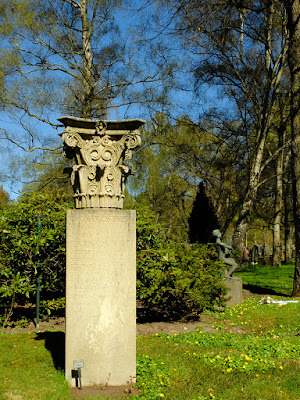 The semi-circle idea was chosen by the cemetery commission, and it was further developed by Carl Gustav Blom-Carlsson after the cemetery’s consecration in 1827. The base of the semi-circle is parallel to the major road to Uppsala, and a double row of trees, an earthen wall, and two parallel ditches separate the calm of the cemetery from the relative chaos of the road. Today, the road to Uppsala is an eight lane highway so the contrast between the din of the concrete highway and the green, leafy quiet of the cemetery is even more marked. The cemetery was consecrated in 1827 and the first burial took place the same year, but it wasn’t actually developed into the semi-circular design until some time later (date unclear). The private mausoleum was built in 1835 and the chapel marking the junction of the middle radial path and the midpoint of the semicircle wasn’t built until 1855. Originally, funerals were held in the deceased’s church in town before burial at the cemetery, but customs changed and soon even the funeral services were held out at the cemetery. By that time, tastes had changed from the strict Neo-Classicism of the semi-circle and the chapel, also designed by Blom-Carlsson, is Neo-Gothic. Aside from the pinnacles reaching toward the heavens, the facade’s ornamentation is in stucco, not carved in stone. Behind the chapel are two buildings which now form a little plaza toward the cemetery’s current “main street.” These were built in 1883 in a Neo-Renaissance style. Again, details are etched into stucco. To the north of the semi-circle, two separate cemeteries were established for Stockholm’s Catholic (1847, map 2) and Jewish (1857, map 3) populations. These cemeteries are demarcated by fences and are still financed by the Catholic and Jewish parishes in Stockholm (the rest of the cemetery is financed by the city). Not only do the Catholic and Jewish populations have their own land for burials, but they even have their own chapels for funeral services. A small, almost abstractly Islamic synagogue was designed by Fredrick Vilhem Skolander in 1857 for the Jewish cemetery. The synagogue's smooth, butter-yellow stucco and ornamentation etched into the plaster are very similar to Blom-Carlsson's chapel. A small Neo-Romanesque/Gothic stone chapel designed by Clason was built in the Catholic cemetery in 1900. A prominent building in the cemetery’s landscape is the North Chapel (map 4) which was designed by Gustav Lindgren and built in 1909. This building is actually both a crematorium and a chapel, and it replaced an earlier crematorium which was built in 1887 as one of the world’s first modern crematoriums. 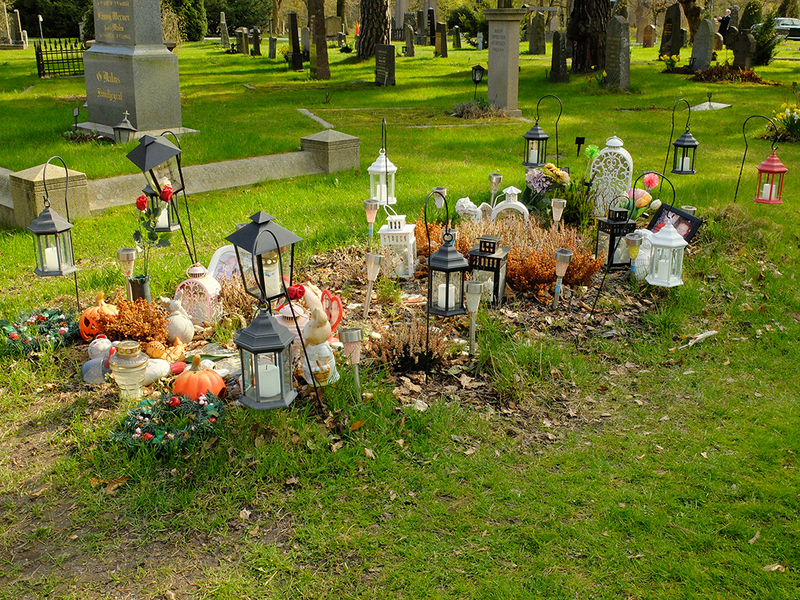 I am not sure why Sweden was so forward-thinking about cremation, but today 9 of 10 Stockholmers choose cremation over a traditional casket burial. The chapel sits on top of the crematorium, hiding the grisly function of the building with a large and widely visible Neo-Renaissance dome. The only clue to the crematorium function are two chimneys which rise up in the back of the building, but they are not visible from the main entry. The crematorium was in use until 1989; today, the building is only used as a chapel. When the Northern Cemetery was first developed, each parish was free to decide if it would continue to bury its members in the graveyard around its church, or if it would use the out-of-town cemetery. Because of the crowded conditions in the church graveyards, many parishes didn’t hesitate to begin using the Northern Cemetery. In the 1880’s, laws changed and it was made compulsory that all parishes would use the suburban cemeteries. 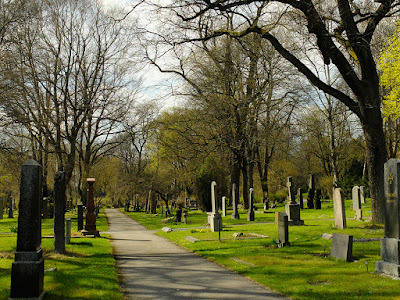 The original semi-circular cemetery was soon outgrown, and adjacent land was expropriated in several rounds to expand the cemetery. This is about where current research ends. The cemetery was expanded several times from the 1830’s to the turn of the century, and a slew of new buildings were built, but there is no published information on which sections were designed when, or by whom. I’ve tried to deduce a chronological order from looking at when people were buried in each of the sections, but nearly all of the sections have representatives from the mid 1800’s all the way up to today. Some of the areas have slightly higher concentrations of graves from a particular period, but the concentrations are not high enough to be a surefire indicator. Today, the cemetery consists of at least 10 different and distinct sections. 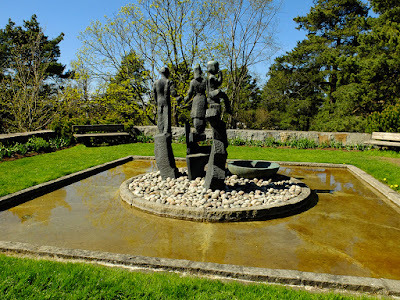 The majority of the sections are very formally laid out, but there are a couple of exceptions, most notably on and around the cemetery’s highest point of Lindhagens kulle or Lindhagen’s Hill. Open areas of graves under hardwood trees alternate with more secluded areas where thick hedges create private and shared rooms. A third, distinct type of landscape are graves under the cover of a pine forest, which creates a much darker and more somber atmosphere. The pine forest can be found on and around Lindhagen’s Hill. 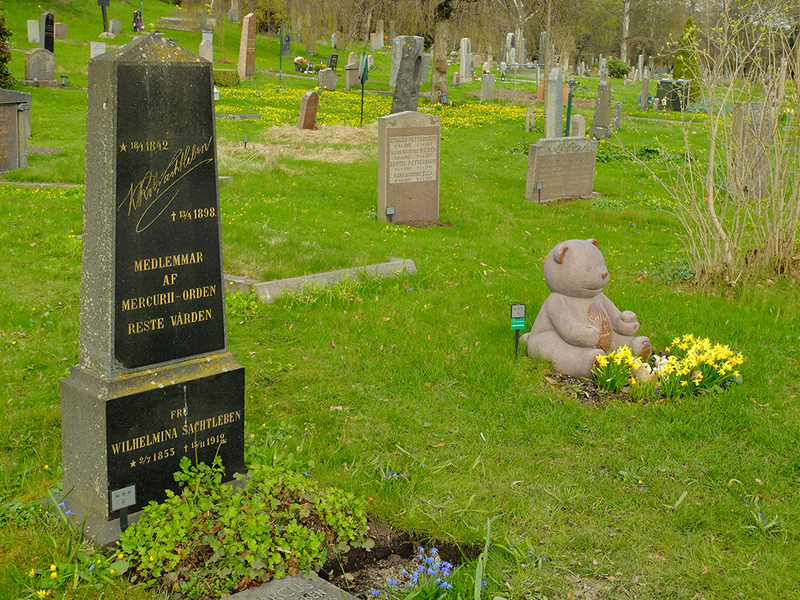 In the southwestern part of the cemetery near Aftonstjärnasväg or Evening Star’s Street (map 5), a very formal area is entered through a portal reminiscent of medieval churchyard portals. A main walk lined by alternatingly tall and short hedges bisects the area, and hedge-defined rooms lead off the main walk. These rooms are triangular and seen from above, they form a chevron pattern, although the complexity of the design isn’t as apparent on the ground. A wall of graves follow the hedges. 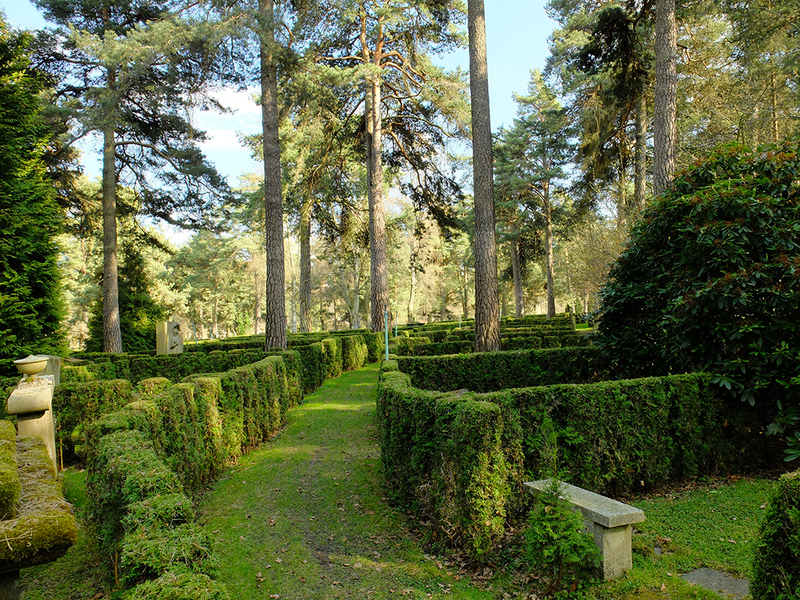 Further down the central walk, the hedges create rectangular rooms and each grave is nestled into its own room. This theme of private rooms is repeated along the poetically named Solglimtsvägen, or Sun Ray’s Road (map 6). Sun Ray’s Road crosses over a slight rise, and the topography adds a lot of drama to the walk because you can’t see over the horizon when walking up the rise. Here, the private hedge-lined areas are a few steps up from the road, and the rooms are considerably larger. The hedges are taller, creating more privacy. Large family monuments occupy most of the rooms, and this area feels much more exclusive than the Evening Star area I just described. Its central location also means that it is far away from all the surrounding roads and is very quiet, surely not diminishing its exclusivity. A more informal area of private, hedge-defined rooms is nestled into the base of Lindhagen’s Hill (map 7). Here, tall pine trees add a roof to the walls of the hedges, making the area feel more intimate. The central walks are grass, instead of paved like in the previous two areas I mentioned. These walkways are curved and a bit meandering, and the area feels a bit like a boxwood hedge maze punctuated by headstones. It’s a quiet, secluded, green and lush area, and I personally think that this area would be better for mourning than the more public, formal areas described above. 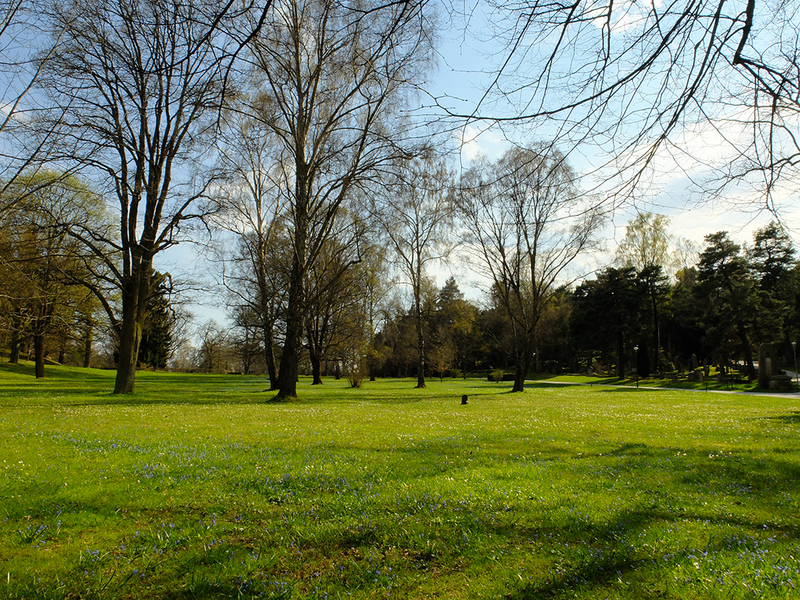 Between the forested areas and the hedged-in areas of the cemetery are sloping meadows and lawns dotted with hardwood trees. Graves dot these more open areas, but they are still more-or-less lined up in well spaced rows and divided into “blocks” by paved paths. A few beautiful, wildflower dotted lawns are barren of graves and will be developed as needed. These more open areas provide a beautiful contrast to the forested areas of the cemetery as well as to the open but very formal areas. These areas are not unique in any way, but the combinations and juxtapositions of different cemetery typologies is fairly unique and makes for a beautiful place. The more modern developments are also fairly open under hardwood trees. But here, much of the idyllic beauty is missing. The lawns are flat instead of romantically sloping, the graves are squeezed much more tightly together, and the regularity of the rows is much more apparent and dominant in the landscape. 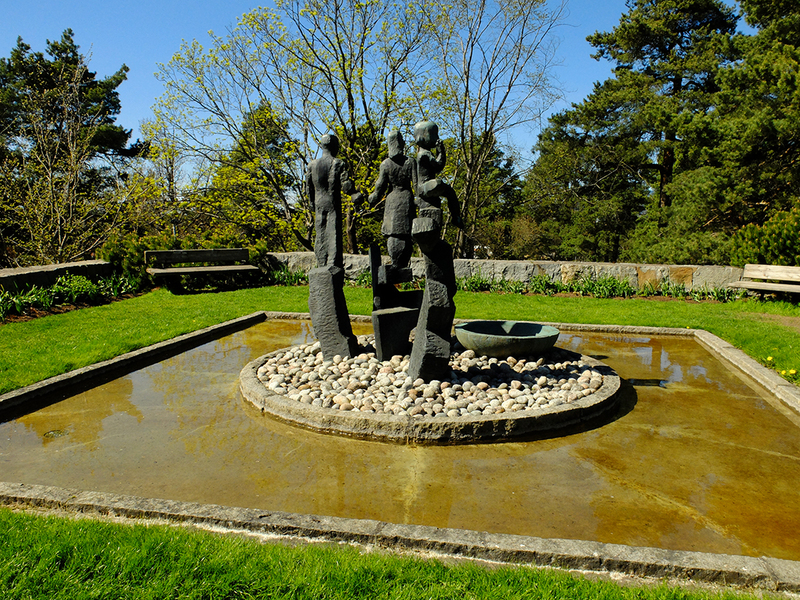 There are also two relatively modern memory gardens where mourners can sit at peace if their loved one’s ashes have been scattered without a grave monument. One is at the highest point of the cemetery and was built in 1978 (map 8). Despite its high position it has no view out over the surrounding valleys. I’m fairly certain that the other memory garden is quite young as it is representative of a new phenomenon where one’s ashes are scattered somewhere other than the cemetery but the bereaved still want to have a monument to their loved ones (map 9). Here, names are etched in glass mounted against a stone wall. Only one wall has glass mounted on it, there are several more waiting to be filled. Both memory gardens feature moving water, probably both for the soothing sound and to provide a degree of acoustical privacy since the areas are very open and public in nature. Another very recent phenomenon in the cemetery is a concentrated area of Roma graves (map 10). Sweden has always had its share of “wandering gypsies,” but it wasn’t until Romania joined the EU that a significant population legally established itself in Stockholm. 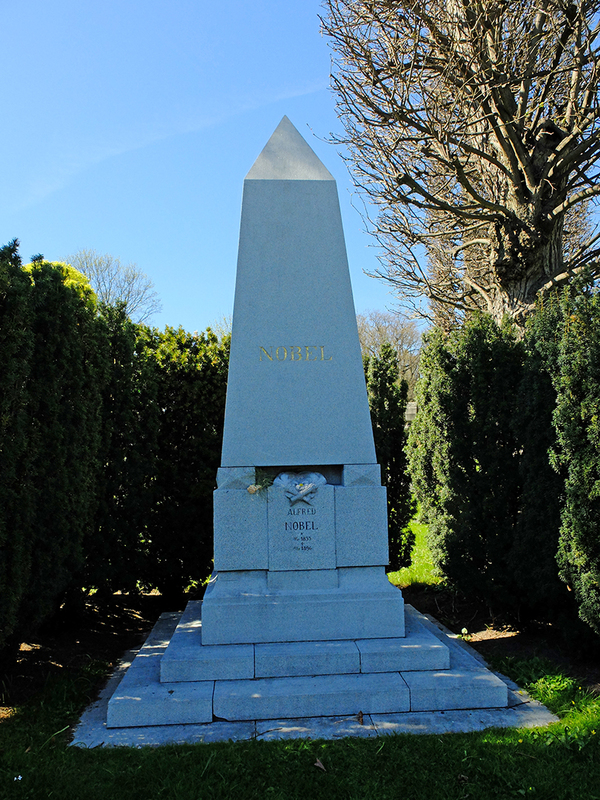 With legal status came the right to be buried in the North Cemetery. The Roma graves are very un-Swedish and are therefore very easy to pick out. While wealthy Swedes were buried with pomp in large, showy graves or even large mausoleums a century ago, today’s grave monuments are understated and generally don’t deviate from the norm in either size or design. In contrast, the Roma graves are huge, three-dimensional structures decorated with gold designs, color photos, an excess of candles, and/or concrete statuary. 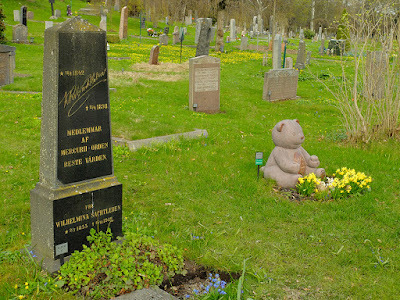 These monuments are the “My Big Fat Greek Wedding” of headstones compared to the graves of modern Swedes. Only the Roma are concentrated into a fairly segregated area (I believe by choice); other immigrants are well integrated into the cemetery at large. Only occasionally does an immigrant grave really stick out. This one, for example, is decidedly not lagom, or moderate. 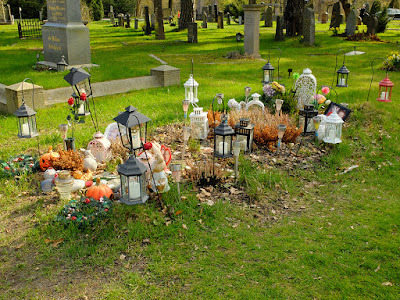 While Swedish graves are generally well tended with recently planted flowers and a single grave candle at All Saints’, this grave was all decked out in May, months and months from Halloween or All Saints’. 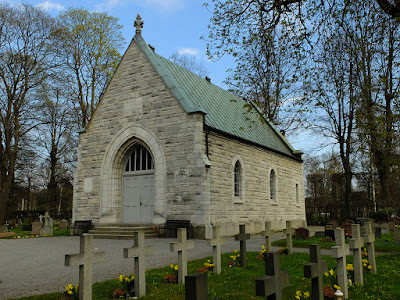 I doubt that I am alone in thinking that Lindhagen’s Hill (map 8) is the most interesting and beautiful area of the cemetery. This part of the cemetery is very Victorian in concept and was probably developed in the 1880’s, although many of the graves are from around 1915. 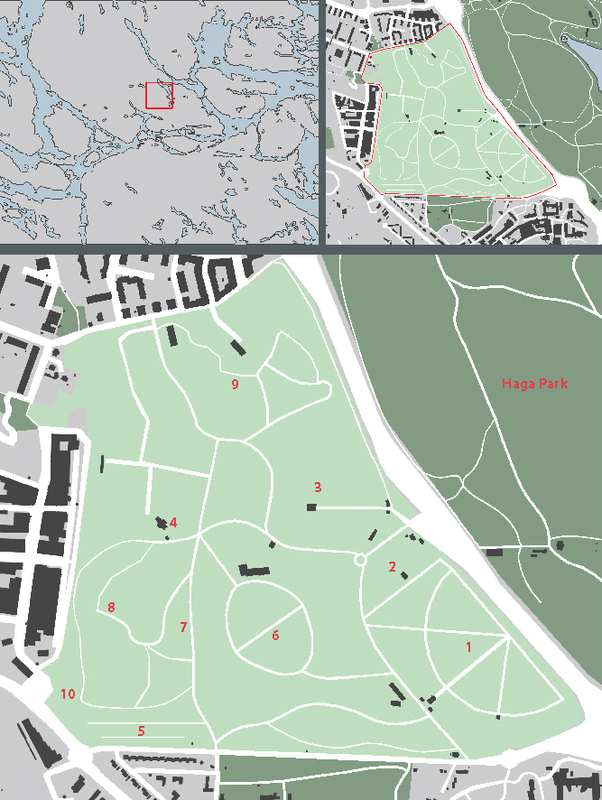 Earlier parts of the cemetery were laid out on easily developed flat areas, but Lindhagen’s Hill is fairly steep and the terrain, the dense pine forest, and the frequent outcroppings of granite do not make for classically imposed order. Instead, the designer (who!?!) worked with the landscape, placing graves along paths which swoop up and down the hill. Many mausoleums in this area are even built into the hill and have a roof covered in grass. In some places, the hillside wasn’t steep enough so a stone wall was built to create a "cave" suitable for a mausoleum. 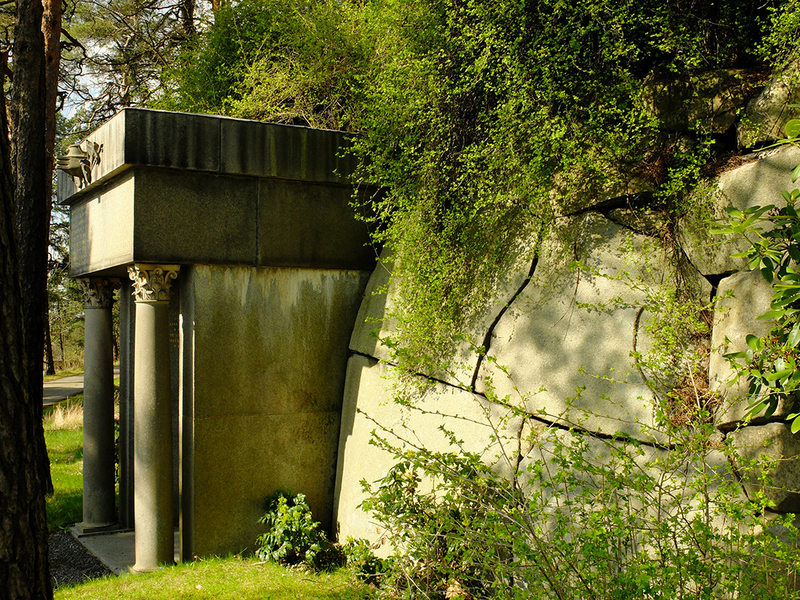 Other mausoleums are freestanding, but even these generally blend into the topography and flora. While other areas of the cemetery have a mix of styles, this area is almost exclusively Neo-Classical. Many of the elements are heavy and earth-bound, but a few of the mausoleums are more Gustavian with light, delicate details that nearly float up to the heavens. 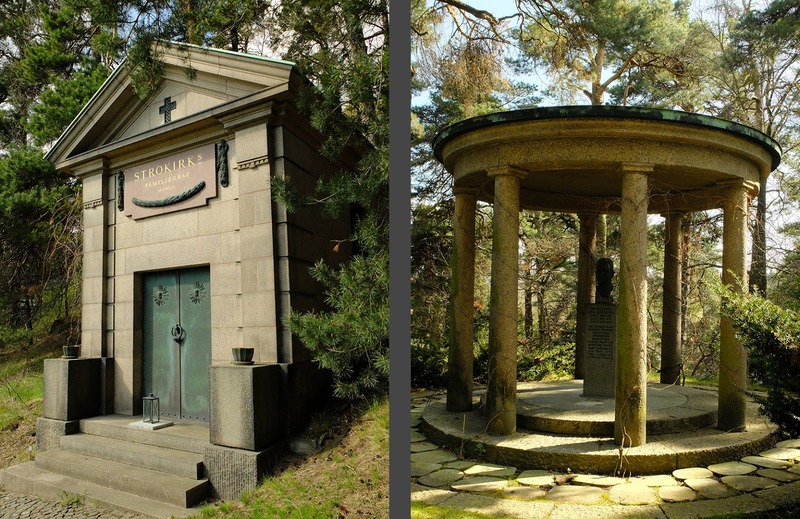 Two of the classical mausoleums stand out as especially important for architects because they were designed by Sigurd Lewerentz and Gunnar Asplund, the architects who designed Stockholm’s World Heritage listed Skogskyrkogården or Woodlawn Cemetery. These two mausoleums are fairly similar in that they are somber, sturdy temples, but Lewerentz’s mausoleum to the left has much less ornamentation than Asplund’s mausoleum to the right. Right: a detail of Asplund's mausoleum. The main exception to the Neo-Classical rule are graves which are entirely worked into nature. Several mausoleums are nothing more than a door embedded into a granite hillside, and another gravestone is just names and dates etched into the living granite. Another exception are monuments mimicking ancient grave types from Sweden’s stone, bronze, and iron ages. The grave of a famous archeologist is like a stone age chamber grave made of giant stone slabs, and several other grave monuments are placed on top of grave mounds mimicking the mounds prevalent in the iron age. Lindhagen’s Hill is a who’s who of early 20th century Stockholm. The extremely wealthy industrial elite are buried here as are the wealthy owners of newspapers, printing houses, and department stores. Politicians from very well-to-do circumstances rest here, and even a few royals are buried here—Oscar Bernadotte gave up his right to the throne in order to marry of his own free will, and was therefore no longer entitled to be buried with other Royals in Riddarkyrkan or in the royal cemetery at Haga Park. On Lindhagen’s Hill, one continued to be neighbors with the same people one had lived beside in Stockholm’s wealthy enclaves like Saltsjöbaden or Djursholm. Even in the afterlife, there was no need to associate with the masses. I find Lindhagen’s Hill very interesting, not only because of the beautiful setting and fascinating architecture, but also because of this segregation in the afterlife. In the mid-1800’s, even the wealthiest of Stockholmers weren’t willing to shell out lots of money to be buried in the “fancy” part of the cemetery along the back of the semi-circle. Even Alfred Nobel, one of Sweden’s wealthiest figures ever was buried among everyone else in the “regular” part of the cemetery inside the semi-circle. But by about 1915, it seems that all of Stockholm’s elite wanted to be buried in showy mausoleums up on the hill. It seems that something in Swedish society changed, making it acceptable to ostentatiously display one’s wealth in the afterlife. This switch didn’t escape Stockholm’s cultural elite. August Strindberg, one of Sweden’s most important authors, called the hill “Fåfängens kulle” or “The Hill of Conceit.” In his will, Strindberg specified that he absolute did not want to be buried on the hill, and that he wanted no more than a simple wooden cross to mark his grave. Apparently, either the money for or the desire for such ostentatious burials eventually dried up, because there are several built-up terraces on the hill that have no visible graves. But regardless of the conceited nature of the hill and of changing burial fashions, I very much like the atmosphere on Lindhagen’s Hill. The ambience is so somber with the dense, dark canopy of pine forest, the grey granite and concrete structures, and the nearly black copper and iron mausoleum doors. 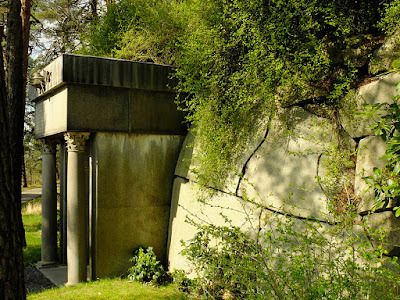 Even though the structures are expensive buildings boasting of the owner’s wealth, they are still relatively reserved and discreet in design, and all of the various mausoleums work together to create a melancholy whole. It’s all so fascinatingly Victorian. Lindhagen’s Hill is literally a city of the dead where corpses and ashes dwell in large, three-dimensional structures. 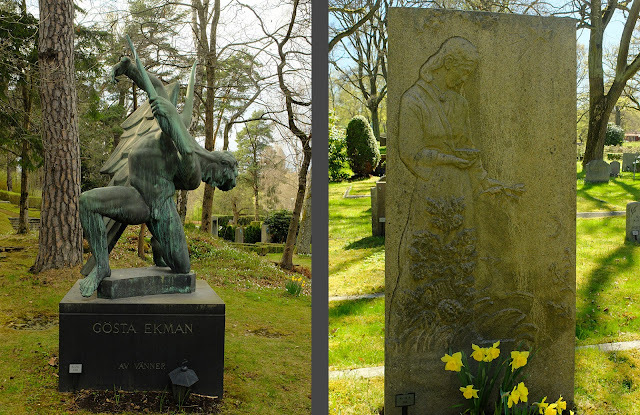 to works of art commissioned by Stockholm’s foremost artists such as Carl Milles (left) and Carl Eldh (right). Many of Stockholm’s cultural figureheads in literature, architecture, art, and music are also buried in the cemetery. Of course I sought out one of Sweden’s important architects, Ragnar Östberg, who has a Corinthian capitol marking his grave. 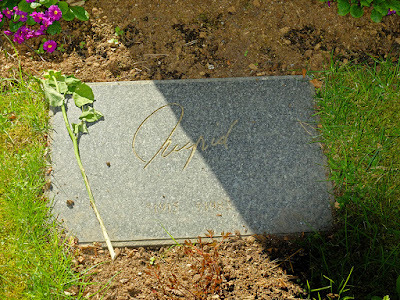 When purchasing a gravesite at the North Cemetery, one originally had a choice between 50 years and eternity. 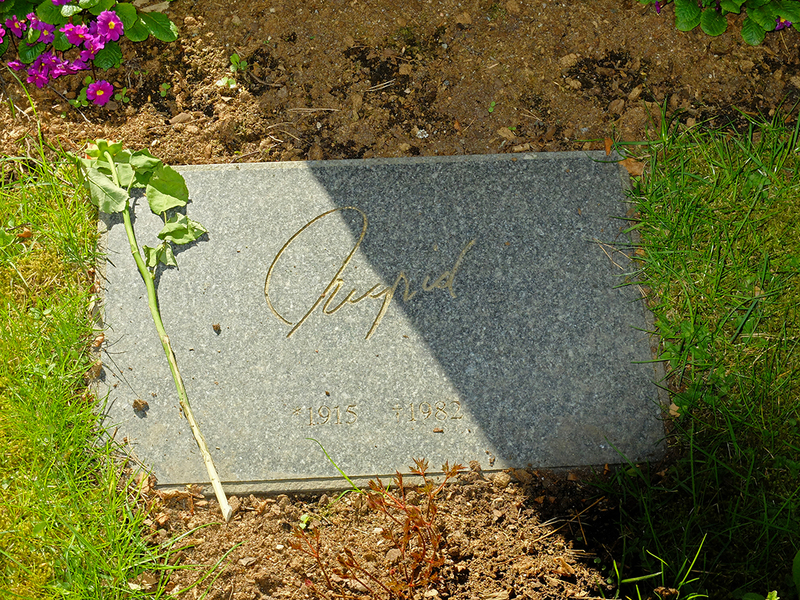 By this point in time, many of the earlier graves have been replaced, and new graves are continually added to older areas. Sometimes, the contrast between a historical and a new grave is startling, but the mix generally works well. Ornate Victorian graves with elaborate cast-iron fences are side-by-side with very simple modern headstones, and modern sculptures are side-by-side with faux Viking rune stones. Although I have mentioned the various types of plantings in the cemetery, I think it is worth noting again because they represent a significant change in how cemeteries were designed and used over time. Stockholm’s cemeteries in the 1700’s were not pleasant places to be. They were purely utilitarian, and parishes didn’t do much to make the cemeteries pleasing. Cemeteries were often muddy, and they stank of rotting corpses. No trees, flowers, or bushes were planted in them. 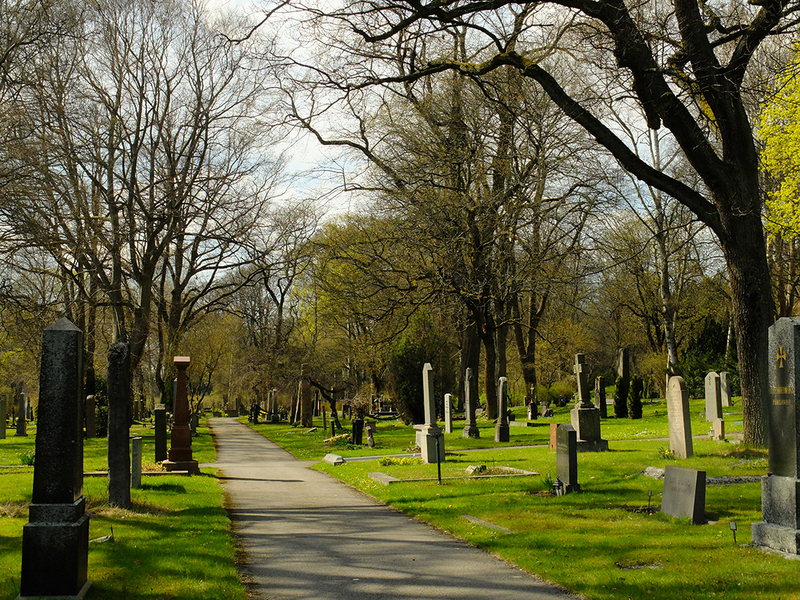 It wasn’t until the 1800’s that cemeteries started to be viewed as parklike landscapes. 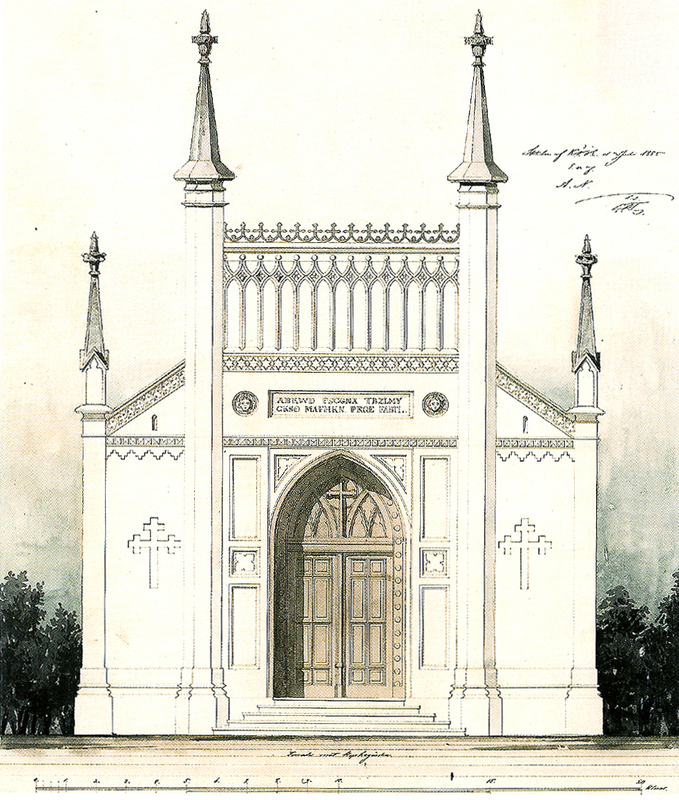 When it was built, the Northern Cemetery was unique in Stockholm because of its structured design and because allés of pruned linden trees were planted along the paths, much like a palace garden. Later in the 1800’s, trees and flowers were planted partly to mask the smell, but also as a symbol for the cycle of life. Hedges became incorporated into the designs and were used to create rooms. On Lindhagen’s Hill, “natural” plantings of pine forest, bramble bushes, wildflowers, and blueberry patches pervade every nook and cranny. Aside from the gravestones, there is little to differentiate the Northern Cemetery from Haga Park next door. This is very evident in how the cemetery is used today. It is still an active cemetery, and funerals are preformed in the chapels and new bodies are interred nearly every day. Mourners sit at graves or on benches, and the graves are often cared for by loved ones. However, this burial and mourning function occurs simultaneously with more parklike uses. Stockholmers jog through the cemetery, and one route through the cemetery is a popular shortcut for bicycle commuters. People walk their dogs here, they go on weekend strolls here, and they even sit on benches to enjoy a snack. They come here to talk in private on their cellphones. One master’s thesis I read in my research for this post included a study of activities in the cemetery, and the vast majority of visitors were there for recreational purposes instead of for mourning purposes. When interviewed, people mentioned that they go to the cemetery instead of to nearby Haga Park because the cemetery is calmer and quieter than the park. This use of the cemetery as a quiet green space would never be possible if the cemetery wasn’t as secure feeling as it is. I, for example, am probably the most safety-conscious person I know when it comes to deserted places and dark corners. I have learned the hard way to trust my instincts about insecure spaces. But although I was always acutely aware of my surroundings and on the lookout for suspicious people, I felt perfectly comfortable wandering alone in even the most secluded, undeveloped, and forested parts of the cemetery. This is a beautiful testament to the city of Stockholm and how incomparably safe it feels. 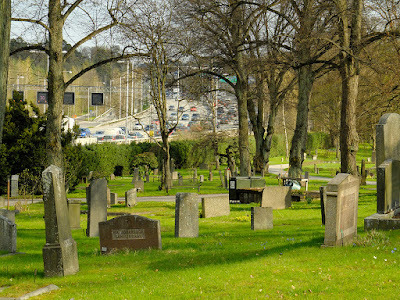 The Northern Cemetery is important in the landscape of Stockholm because it provides a different kind of green space. It is a place where one can be quiet and contemplative, even if one is not mourning a lost loved one. It is a place where one can be unconsciously alone; there is a total lack of social pressure to be in the company of someone else, unlike the highly social Haga Park next door. I also think this cemetery is also an important lesson for us architects, because its significance lies not only in its original intended purpose, but also in an evolved pattern of use that was never imagined by the original designers. We architects are often so focused on implementing an idea for today’s society that we don’t think about how our spaces might evolve over the centuries. I don’t really think that an architect could consciously and successfully anticipate tomorrow’s needs and uses of a space, but an architect can design a space without placing unnecessary restraints on the space’s future evolution. A truly successful space doesn’t just meet the needs of today, but it can evolve to meet the needs of tomorrow, too. All images are mine unless marked *. Those are from Schönbäck's book listed above.